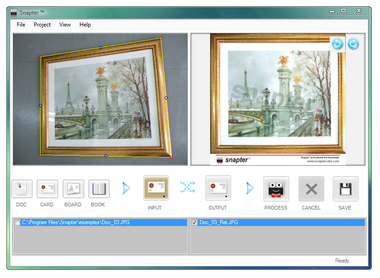 Snapter Ice is software that lets you use a camera as a scanner. 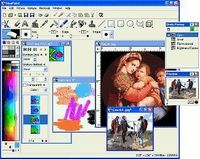 The software automatically crops, stretches, flattens, and process pictures of business cards, documents and whiteboards into more usable forms. With Snapter, you can use your digital camera to capture information around you that matters: receipts, business cards, whiteboards in a classroom, posters in a conference, a menu at your favorite restaurant, or even books in a library. 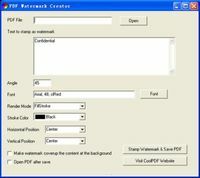 Just take a photo of the document, run it through the Snapter software and you will have an output that looks like it has been scanned through a flatbed scanner.